Barcode Essentials™ licensing is device based, and each device that synchronizes with your server needs its own license. There is no concurrent user licensing in Barcode Essentials. * Applies to Barcode Essentials Solution 7.6 & 8.0. Both Barcode Essentials Solution (all versions) and Barcode Essentials for iPhone app (from App Store) are free to download and install. Only the synchronization of data between a device and your CMDB server is licensed. Every device needs its own license. Devices obtain licenses automatically when they synchronize with your server; you don't need to assign them manually. Licenses obtained from a server are only valid for that server. If a device is synchronized with a different server, the device will need a new license from the new server before it can be used. When the device syncs with its original server again it will re-obtain its original license and not consume a new one. 3 staff sharing 2 iPod touch devices only need 2 Barcode Essentials device licenses on the server. 1 staff member using a single iOS device plus the Barcode Essentials Console Application will require 2 device licenses, as the iOS device and the Console Application are classed as separate devices. 1 device shipped back and forth between 2 offices in different cities each with its own separate Symantec CMDB server requires 2 Barcode Essentials device licenses, one for each server. 1 device shipped out to remote locations to complete asset workflows (e.g. inventory) but then returned to the office to synchronize requires only 1 Barcode Essentials device license as there is only 1 server in use. When you buy Barcode Essentials device licenses you will receive a single Redemption Code representing all of the licenses in your order. 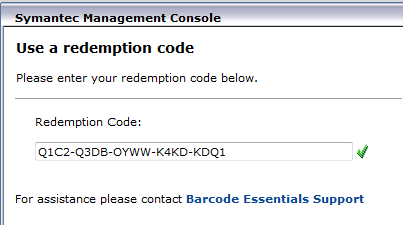 After installing Barcode Essentials Solution, you can use its IMPORT or REDEEM wizard on the License Usage page to enter your Redemption Code. Your licenses will be validated against a central activation server over the Internet and installed automatically during the process. Licenses are stored in tables in the CMDB database so are backed up automatically when the overall database is backed up. For convenience though, licenses can be exported to a License File which represents an secure version of your licenses that you can use later to reinstall them via the IMPORT or REDEEM wizard again. If you purchased device licenses at different times so received more than one Redemption Code, then each Redemption Code will be exportable to its own License File. You can also reuse your original Redemption Code again to regain your licenses, as long as you do so on the same server. If you back up licenses on one server and want to restore them on another, you must Migrate your licenses first.